The food and coat drive in November resulted in 1600 pounds of donated food being delivered to the People to People food bank in Nanuet. In addition, 49 new or gently used coats were donated by employees. Pearl River volunteers who helped spread the word about the drive included (pictured, left to right) Jennifer Tejeda, Lorna Nunez, Karen Albert, Jennifer Obregon, Kayleigh Maher, Art Illenberger, Annette McMonegal, and Kieran Curley. Virginia Caraballo, Claudia Bakhtiary, Jeannie Diamandas, Lindsay McLaughlin, Priscilla Alba, Jeni Santiago and Mikele Simkins also volunteered to help. In what has become a yearly tradition, Pfizer employees in Pearl River resolved to brighten the holidays of children in the Rockland County community with a toy and gifts drive for People to People in December. Donations were made to the People to People Project Joy! Store and included action figures, arts and crafts kits, books, building games, dolls, educational toys, scrapbooks, sports games and toy trucks. 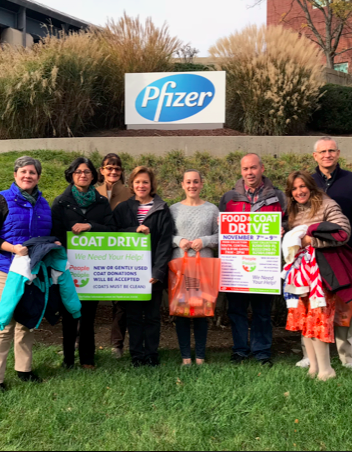 The People to People food bank in Nanuet also received support from Pfizer in November when a large number of colleagues at the Pearl River site participated in a food and coat drive. The food and coat drive resulted in 1600 pounds of donated food being delivered to the People to People food bank in Nanuet as well as 49 new or gently used coats. Donated food items included various ingredients for families to celebrate a traditional Thanksgiving Day dinner. People to People, based in Nanuet, is Rockland County’s largest hunger relief organization. It served an average of 1,545 Rockland households per month last year, and also provides weekly food packages to approximately 270 children in afterschool programs at the Nyack Center, Haverstraw Center and Martin Luther King Center as well as Rockland Community College for their students in need.